Nationalism consciousness, which is not nationalism, is alone capable of giving us an international dimension,” declared Frantz Fanon to the 1959 Congress of Black Writers and Artists in Rome. The 1959 Congress was a gathering of Pan-Africanists and newly elected leaders of postcolonial states in Africa. Fanon sought to challenge their understanding of nationalism, regionalism, and internationalism with his speech. In this paper, I argue that this line from Fanon’s speech holds the key to understanding how he articulated a novel conception of nationalism and internationalism, and doing so gives us an account of collective politics that is global in scope. To substantiate this account of collective politics in Fanon, I develop three interrelated concepts: solidarity, intercontinentalism, and vigilance. 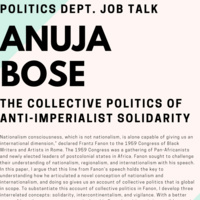 With a better grasp of how these concepts are articulated in Fanon’s writings, it is possible to gain a clearer understanding of how he envisioned a collective politics of anti-imperialist solidarity during the postwar conjuncture of the twentieth century, and moreover how such an account can help to illuminate the possibilities for collective politics today. Presented by The New School for Social Research.